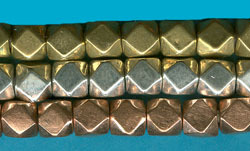 Home / Beads / Brass and Plated Brass / Priced by the Strand / BB075 2-2.5 x 2-2.5mm Cornerless Cube Brass Bead Strands. BB075 2-2.5 x 2-2.5mm Cornerless Cube Brass Bead Strands. Approx. 2-2.5 x 2-2.5mm cornerless cube brass, 1mm hole. Sold in 24″ strands, approx. 260 pieces. Due to the handmade nature of these beads, strand length, shape and size may vary. Made in India. Click here for larger image. Available in Brass, Silver Plated, Copper Plated, Gold Color and Gun Metal Color. $6.00 strands can be mixed and matched to receive the quantity discounts. Our website is not set up to calculate price breaks between item numbers. We will make the necessary adjustments in our office and run your credit card manually.